For a limited time, Discount Mags is running a Digital Magazine Subscriptions Sale! Remember you can gift magazines to your friends or get these as a new subscription or renewal for yourself!Have something else in mind? Use coupon code COUPONINGFOR4 to get 20% off of almost anything else!Top … [Read more...] about Digital Magazine Subscriptions Sale! 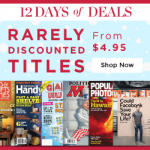 Rarely Discounted Titles Magazine Subscription Sale! This weekend Discount Mags is having a Rarely Discounted Magazines subscription sale! Remember you can gift magazines to your friends or get these as a new subscription or renewal for yourself!Have something else in mind? Use coupon code COUPONINGFOR4 to get 20% off of almost anything … [Read more...] about Rarely Discounted Titles Magazine Subscription Sale! Gifts For Kids And Teens Magazine Subscription Sale! Today and tomorrow only, Discount Mags is offering great deals on Magazine Subscriptions for kids and teens! Remember you can gift magazines to your friends or get these as a new subscription or renewal for yourself!Have something else in mind? Use coupon code COUPONINGFOR4 to get 20% off of … [Read more...] about Gifts For Kids And Teens Magazine Subscription Sale! Gifts For Gossip Fans Magazine Subscription Sale! 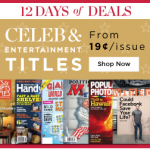 Today and tomorrow only, Discount Mags is offering great deals on Top Gossip Magazine Subscriptions! Remember you can gift magazines to your friends or get these as a new subscription or renewal for yourself!Have something else in mind? Use coupon code COUPONINGFOR4 to get 20% off of almost … [Read more...] about Gifts For Gossip Fans Magazine Subscription Sale!